Our History - 森美進口公司 Summit Import Corp. 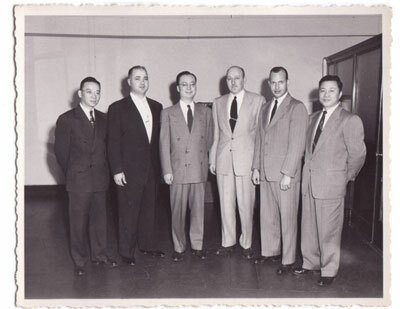 It was June of the 1948, four Chinese graduate students from Massachusetts Institute of Technology formed a company in New York City and they named it Summit Industrial Corporation. Three months later they hired another Chinese young man who has just finished his MBA studies at New York University graduate school of business. This young man was Lin Chen who was to become the founder and first president of Summit Import Corporation. His first duties were office management as well as help with the import of food products. This was the precursor for Summit Import Corporation. After repeated failures the division had lost almost all its assets and Lin Chen had to reorganize the company and divest itself of everything except the import of food. At that time the company's procession consisted of a desk, a typewriter, and an abacus. During the next few years of rebuilding the company hired new staff, rented a small warehouse and bought a delivery van. Their scope of business consisted of importing of "Maling" brand canned vegetable and fruits from Taiwan, frozen shrimp from Hong Kong, canned mushroom from France and the packing of tea under the "Fuloon Brand" label. With each passing year the verity and volume increased. By 1965 Summit Import had leased a four story warehouse building on 8th Ave. and 10th Street. Just as Summit Import as finding its stride and establishing itself, a major customer declared bankruptcy and defaulted on its account balance of over fifty thousand dollars. More troubles came in the form of a law suit under the "foreign assets control act", with fines and business restrictions imposed. A supplier in Hong Kong cheated Summit of twenty thousand dollars. The combination of these events caused a major crisis for the company, and its financial viability was in serious doubt. Fortunately, under Mr. Lin Chen's leadership and the support of his loyal wife Mrs. Susie Chen, the company had put down firm roots within the Chinese community; and it was able to weather the storm and survive these challenges. The company had diversified itself into other ethnic markets such as the Korean, Japanese and Philippino outlets. We represented such well regarded brands such as Taiwan "Maling", "Sunlih" noodle, "Kikkoman" and "Kadoya". In 1969, the warehouse Summit Import was leasing was scheduled for demolition and we had to vacate. To help finance the purchase we entered into an agreement with another company to lease-purchase two floors of a very ideal warehouse building near Chinatown. After three years, when the real estate market was hot, the other party renounced the agreement and started eviction proceedings. The case dragged on for years and again Summit found itself fighting for its survival. Finally the case was settled in 1973, and we had the resource to buy a warehouse building of our own at 491 Greenwich Street in downtown Manhattan. During the seventies Summit Import entered a new phase of growth and development. We were appointed as a distributor of Taiwan canned mushroom, by Mr. Koo See Kee the president of the Taiwan Mushroom Packers United Export Corporation. The mushroom business was our stepping stone to future development. Mr. Lin Chen had always remembered Mr. Koo as a great mentor to our company. President Richard Nixon visited China in 1973, began the process to normalize relationship between the two countries. This started the "China Fever" in the U.S.A. Changes in the trade regulations and immigration laws boosted the import trade. Chinese markets and restaurants and indeed whole communities sprang up in cities. Summit Import also entered a period of rapid growth, and operated from two warehouses. In 1976, Mr. Whiting Wu graduated from Hong Kong University and immigrated to the United States, he was offered an entrance level position with Summit Import. He also enrolled in New York University and began work on his MBA studying part time. He helped to install the company's first computer system and helped to strengthen its management. Whiting Wu was just in time to help locate a warehouse building in the Tribeca district of New York City. It had eight floors with a full basement. We built an office and shipping receiving facilities on the first floor. In 1977 Summit moved to 415 Greenwich Street. Summit Import thereafter grew from strength to strength. We expanded our reach from the east coast to the west coast of U.S.A., into Canada, Central and South America, the Caribbean and even Europe. We represent many of the best brands in the industry. Such as: Ve Wong, AGV, Companion, Tong San, Wu Hing From Taiwan; Vitasoy, Ching Kee, Tang Hoi Kee, Doll frozen food, Siu Chong Lung, Pin Dinh, Pat Chun from Hong Kong; Kikkoman, Kadoya, Tiger from Japan; Gold Key, Nan Yang from Thailand; Newton, Rufina from the Philippines. Summit also has a line up of private labels which are well respected in the market: Oriental mascot, Golden Summit, Nei River, Mount Tai all enjoy solid reputations from consumers. In 1984 Mr. Whiting Wu succeed Mr. Wellman Wu to become the general manager of Summit Import Corporation. He greatly contributed to the continued growth despite many challenges. An old Chinese saying says "It is difficult to establish an enterprise; however, it is even more difficult to maintain a successful enterprise". Mr. Wu is determined not only to maintain but to build upon the successes of the past. In 1997, Mr. Lin Chen passed away at the age of 83. It was a great emotional loss to the company and the community. Mr. Lin Chen earned the love and respect of all who knew him; he left behind a well established net work of business entities in many countries, bringing prosperity and opportunities to hundreds of people. Mr. Chen truly believed in giving back more than what he received. In the last years of his life he and his wife devoted much of their time energy and money in charitable works. Years from now children will continue to benefit from the hospital ward that he help build, and help maintain through grants from his trust, the blind and disabled will also get employment training at the Foochou School for Deformed Children which he endowed. The project that Mr. Lin Chen was most proud was perhaps his efforts to reestablish his old high school in China - the Anglo Chinese College in Fuzhou; which was started by Christian missionaries in 1881. Today, with a devoted staff, a progressive board, and supportive alumni network; the school is among the most modern and successful institute of higher learning in Fuzhou. Mr. Lin Chen also had the vision to support Mr. Whiting Wu to prepare a complete succession plan. This was implemented and culminated with a reorganization of Summit Import Corporation's ownership and management passing on smoothly to a new generation. In September of 2000, Summit Import Corporation relocated to its new headquarters and logistic center at 100 Summit Place in Jersey City New Jersey. The newly constructed facilities occupies a ten acre site, six miles from down town Manhattan and a stone throw distance away from the container piers and the New Jersey Turnpike. Our office building, which has a clear view of the Manhattan skyline, is named "Lin Chen Building" in honor of our founder whose vision was the guiding light behind our new campus. The warehouse has an area of 120,000 sq ft with 40 ft high ceilings. It also has freezer, refrigeration and air conditioned storage facilities. The warehouse is equipped with metal racking system. Inventory storage and retrieval is done by means of a computerized radio control system. Summit import Corporation has recently began full operation of its mid-west branch facility. It is located in the Chicago suburb of Bolingbrook, Illinois. Near both inter-state 55 and 355. The brand new building of over 55,000 sq ft has a ceiling height of 30 feet: contains a modern office, dry Warehouse, refrigerated and frozen storage. The Warehouse is equipped with steel racking system to maximize cubic utilization. With six interior and exterior loading bays, goods can be speedily transferred between Warehouse and vehicles. Summit has trucks standing by to serve its retail and wholesale customers in the midwest region. We are proud that our facilities are among the most modern and efficient in the industry, with ample room for future expansion. Our logistic center will enable Summit Import Corporation to better serve our customers in many years to come, and fulfill our mission to be "The Grocer's Grocery". Summit Import Corporation will achieve Mr. Lin Chen's motto: "Seek not the blossom that blooms and fades. Rather cultivate the evergreen that roots and endures".